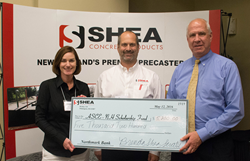 Shea Concrete Products raised thousands of dollars for civil engineering students and broke the company's record for attendance of a personal development day. Events like this are opportunities for us to stay ahead of the curve when it comes to recent developments in the industry. Over 75 members of the precast concrete and engineering industries met in Bedford, New Hampshire, for the Professional Development Day by Shea Concrete Products. Attendees earned six Personal Development Hours over the course of the all-day seminar. They heard presentations given by numerous industry experts. The presentations’ topics ranged from the practical applications of products like GeoFoam, to the use of 3D printers in creating prototypes and visual aids for engineers. The keynote address was delivered by Damon Carson, Founder and President of repurposedMATERIALS. He stressed that all industries are increasingly adopting strategies that reuse and repurpose spent materials for use in other products. In his presentation, Carson argued that everything from outdated advertising banners and used street sweeper brushes can all find new life in industrial settings. $5,200 from the Personal Development Day registration fees went to the ASCE-NH Scholarship Fund, which provides scholarships to graduating high school seniors and University of New Hampshire students studying civil engineering. In a separate event held after the seminar, Shea Concrete Product’s General Manager, Bob Flores, was formally recognized, taking home a Spike Award from the Northeast Builders and Remodelers Association. Family-owned and operated since 1949, Shea Concrete Products is one of New England's largest suppliers of precast concrete products, serving both commercial and residential industries. The company is National Precast Concrete Association (NPCA)-certified, and produces environmentally-safe concrete products, including bulkheads side entry, precast curbing, retaining walls, utility structures and standard steps. Serving all of New England, Shea Concrete is headquartered in Wilmington, MA, with additional locations in Rochester, MA, Amesbury, MA and Nottingham, NH. Learn more information on Shea Concrete's products, past projects, awards and more at http://www.sheaconcrete.com/ or call 1-800-696-7432. Follow Shea Concrete at facebook.com/SheaConcrete.